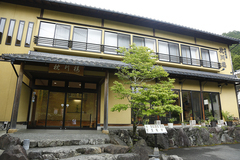 All rooms are traditional Japanese style with en-suite washroom and balcony. 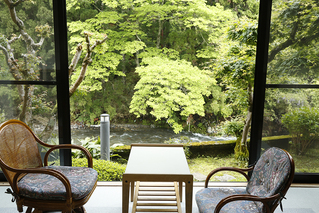 All rooms overlook the adjacent forest and small stream. 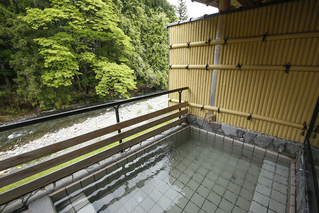 Outdoor bath overlooks stream and forest. Take a night bath under the stars. 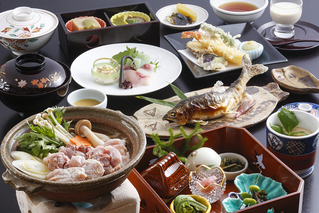 Japanese dishes and multi-course meals made with local ingredients. Each guest room has an en-suite washroom and a balcony that overlooks the adjacent forest and a small tributary stream. 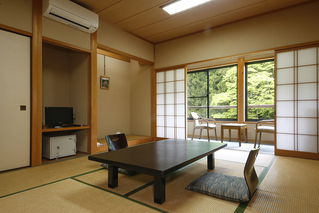 The décor is traditional Japanese, futons on rice straw mats. The sound of gently flowing water outside will lull you to sleep at night and chirping birds will greet you in the morning. With both indoor and outdoor tubs, you'll want to take advantage of the beautiful bathing area. The water is taken from the clear mountain stream and heated up; full of minerals, the water's said to be good for arthritis, muscle and nerve pains. You can often hear birds singing as you bathe in the outdoor bath. It's customary in Japan to have a bath when you arrive, to refresh after your journey. Japanese people often have another bath just before going to bed as it can help you fall asleep more quickly. The Japanese love bathing so much that they often have another in the morning before departing. Bath hours: 4pm to 10pm and 6:30am to 9:00am. For anyone who is not comfortable with the communal bathing area (the baths are separated into male and female areas), you can reserve a private bathing time from 3pm to 3:50. This is the only time slot that is not open to the other guests, and if you would like to reserve it you must do so in advance (fee for private bath is 2000 Yen). First take the train to Sonobe JR from Kyoto JR which takes 46 minutes (or 30 by express). Next you must change trains at Sonobe and take the train to Hiyoshi JR station which is 10 minutes from Sonobe JR.
Then take the bus service from Hiyoshi JR train station that stops two minutes’ walk from Chinsenro at Chimiguchi – many people choose this option, but be sure to confirm the bus times as there are only a few per day. Many customers choose to rent a car, as the roads here in Miyama are largely free of traffic and quite easy to drive on. This also gives you the freedom to move around the area at will. Chinsenro is located about 60 kilometres from Kyoto station.